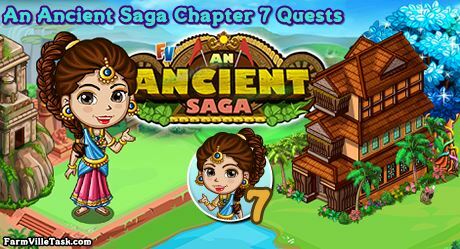 Our friends has just found a way in locating where the jewel thief is hiding in the court of King Gaya in FarmVille The Burning Hat, An Ancient Saga Chapter 7 Quests. We will attend the meeting where this incident will be discussed. Let’s make sure the meeting will go well in this mission. On this chapter of the An Ancient Saga Quests, we will be crafting 6 recipes at the ANCIENT CENTRE. Prepare collecting the bushels ahead so that you will be ready for the crafting part. Note: Expected to be released on Monday (April 15). Info: Crafted at the ANTIQUE CENTRE and will need Pini Jambu Bushels x9, Cape Gooseberry Bushels x9 and Beach Cherry Bushels x6. Info: Crafted at the ANTIQUE CENTRE and will need Balsam Pear Bushels x6, Caterpillar Banana Bushels x6 and Beach Cherry Bushels x9. Info: Crafted at the ANTIQUE CENTRE and will need Pink Gooseberry Bushels x6, Ginkgo Fruit Bushels x6 and Paradise Banana Bushels x6. Info: Crafted at the ANTIQUE CENTRE and will need Ruby Strawberry Bushels x4, Irvingia Mango Bushels x4 and Dowefruit Bushels x4. Info: 16 hour to grow and harvest. Info: Crafted at the ANTIQUE CENTRE and will need Ginkgo Fruit Bushels x9, Sunkissed Mango Bushels x9 and Salmon Berry Bushels x9. Info: Crafted at the ANTIQUE CENTRE and will need Nagalinga Flower Bushels x6, Ruby Strawberry Bushels x6 and Cotton Burst Bloom Bushels x6.